Aker BioMarine has decided to use the United Nations Sustainable Development Goals (SDGs) to guide its strategy. In 2016, all employees were engaged in the process of integrating the goals. The company has prioritized four SDGs. The 17 SDGs adopted by the 193 member states of the UN is a universal call to action on sustainability, and are believed to impact the purpose of businesses worldwide. In order for sustainability to drive long-term financial performance of a company it needs to strengthen business performance through the mitigation of risk and/or create new market opportunities. Secondly, a sound sustainability strategy aims to improve both the social and environmental performance of a company. For Aker BioMarine we have chosen to let goal number 2, 3, 12 and 14 direct our business operations. The figure below shows how two of the goals (2 and 3 on food and health) represent our motivation for being in business, and the latter two (12 and 14 on responsible consumption/production and ocean) guides the way we do business. We suggest that the key to successfully integrating the SDGs into business is prioritization. The opposite of going through all the 17 goals and “tick the boxes” with existing efforts, and coming up with initiatives for areas where you are not currently doing anything. Our experience is that certain goals resonated better with our business model, and that it is better to focus our contribution towards these, than to spread our sustainability efforts out thin. Of course, this does not mean that it is ok to undermine any of the remaining goals that you decide not to focus on, or to lead an organization on a contradictory path. Taking a good look at the goals and identifying how they relate to your core business operations is a useful exercise, and works great as a backdrop to selecting where your company has a real shot at contributing. What resources and capabilities does the company have? Where can the business contribute to achieving the goals? Based on this, the goals can be included in the company’s strategy to engage with its employees, and drive initiatives and programs. 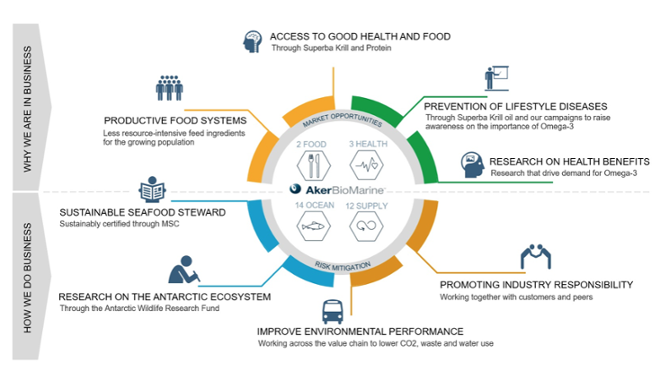 At Aker BioMarine, the SDGs are part of our strategy. We had in-depth discussions with the executive team, we ran a strategy seminar where all employees learnt about the SDGs and how they are relevant to our business. Through @workplace, our internal communications tool, we had a poll where all employees could vote on which SDGs the company could contribute the most. It was interesting to see how much people in the company identify with the SDGs and agree on what our focus should be. Discussing the SDGs gives corporate culture a boost and provides meaning in our everyday work life. We are no longer just harvesting krill in the Antarctic in a sustainable way — we are improving human and planetary health. At the basis of our work with the SDGs lie our values; determined, sustainable, diverse and proud. Without these values, we would have chosen to reduce our negative footprint on the environment and maximize our positive impact through our products. Instead, we set ourselves the ambition to improve both, meaning that we aim to have a positive impact on both the environment and society. With this ambition, we are moving beyond the traditional way of thinking about sustainability as a way of minimizing our negative externalities on the environment, but rather for the world to become a better place because we are doing business in it. Therefore, Aker BioMarine is embarking on a journey to significantly reduce and offset its carbon emissions. With a long-term ambition to improve planetary health, the company is evaluating infrastructure upgrades and collaborating with third parties to reduce their carbon footprint across the value chain. The focus of action and reporting will be key projects that reduce CO₂ emissions, rather than making incremental improvements. A part of our belief is that we all have to envision to go the extra mile, and that we have to leave perfectionism behind. 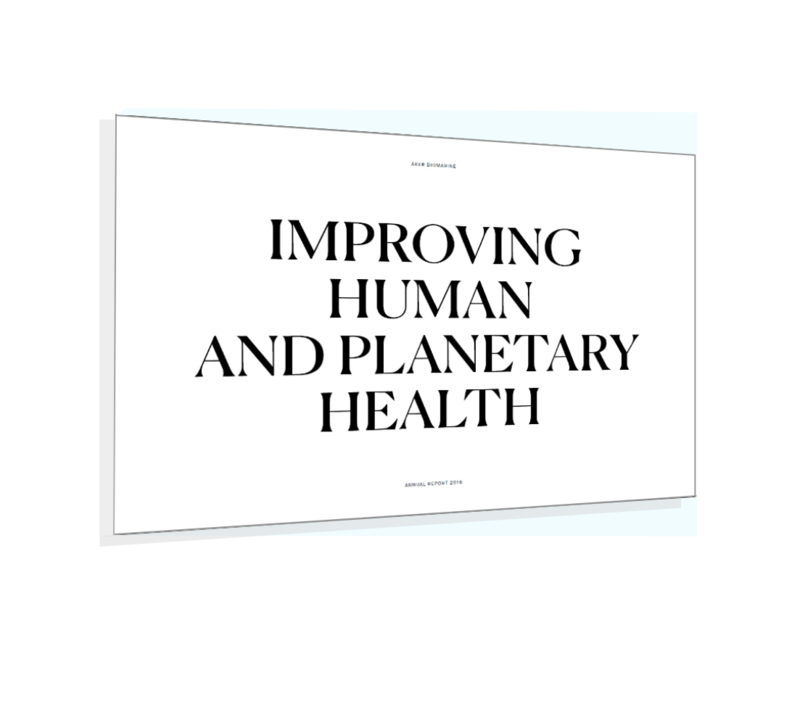 We will stumble and fall in our attempt of improving the health of the planet, but we think it is of greater importance that we are moving in the right direction and learning from the mistakes we make. Now, we are inviting all companies to join. There are clear benefits to having an all-inclusive plan like the SDGs where all companies can find their unique subset of goals that match their company culture and can inform their strategic direction based on global risks and opportunities. It is important that the SDGs do not become just another tool to report on what you are doing, but rather drive your company and the way you run it forward. This is not charity, it is a way of future-proofing your business.